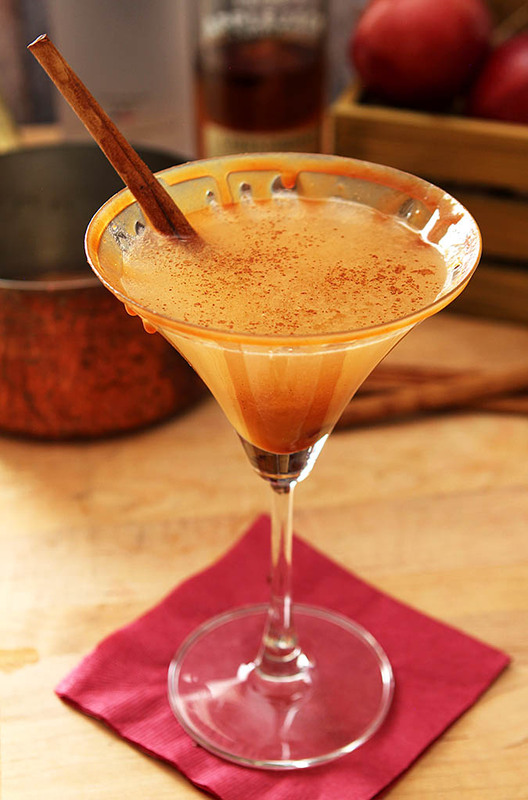 This is a lovely cool weather dessert cocktail with flavors of apple and caramel; the vodka keeps this Warm Caramel Apple Cider Martini honest as a cocktail and it’s so good! Did you know that Sunday is National Vodka Day? Yep…a day of celebrating just for all things vodka (does that include potatoes?)! Who decides these things anyhow? Some marketing guru of course but what the heck, I’ll play along; I think any day is National Vodka Day! We’ve had an exceptionally warm and dry September so though you were probably getting sick of my summer mantra the fact is I have accepted that Fall is here. Truth is it’s not really quite cold enough for this cocktail in Colorado but true to our wacko weather, we could go from 80 to 30 overnight. Literally. So I’m ready! Fall is a bit ambiguous here. Denver has no gorgeous fall leaf color as far as I’m concerned; we are not a city with trees everywhere. The big draw in Colorado is to go into the mountains to see the Aspen. One tree, one Color. Sure it can look pretty but; make that a big BUT…nothing to compare to the multi-hued beauty of any place else I’ve ever lived. St. Louis with it’s old neighborhoods and arching oaks and trees almost sparkling with red, orange and gold. Raleigh with a mix of more evergreen but still breathtaking. I’ve never been to New England but it’s on my bucket list and I want to be there in the Fall. Still, I’ll be putting out a Fall wreath on my door this weekend and wrapping some lights and more Fall decor around my wrought iron rail and with a weather forecast that promises a change is coming, I think it would be most appropriate to have this libation in hand. It’s not HOT, it’s just slightly warmed to take any chill off; both the cocktail and you. And it’s so good; the apple, vodka and Applejack liqueur combination is met on the rim with a touch of caramel. Just right. A sweet friend of mine moved to Alaska last year; they’ve already had snow. How about you…seeing signs of Fall in your neck of the woods? 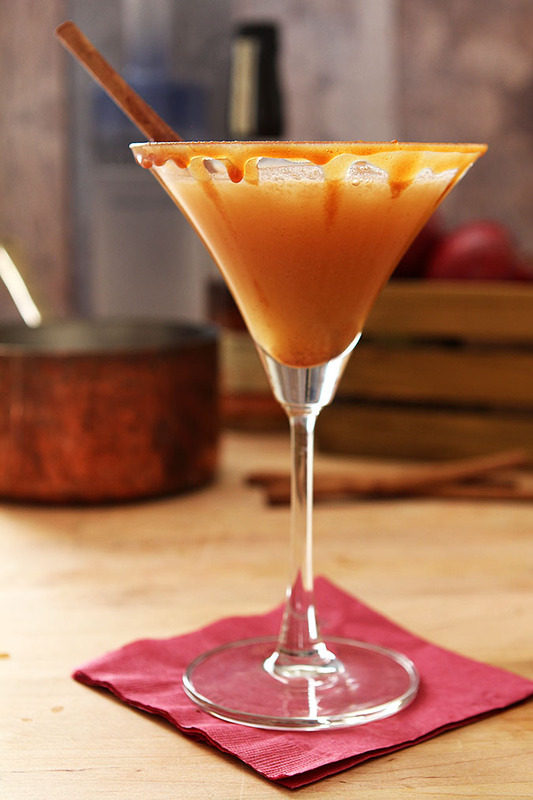 Get ready…and have this Warm Caramel Apple Cider Martini ready to sip when it shows up at your door; you won’t be sorry! Too soon? Then try one of my other Fall favorites; they’re all divine! Combine the cider, vodka and apple liqueur in a small pan over low heat. Warm just enough to take the chill off, do not boil. Pour some caramel in a shallow bowl. Dip your glasses in the caramel, turning them enough to make sure the entire rim is covered; turn them over. Let them dribble if they must! Pour the martini mixture into the glasses. Sprinkle the top lightly with the cinnamon and garnish with the cinnamon stick. Back from vacation! We had some outstanding drinks, but nothing as good looking as this. So perfect for the season! Thanks. Oooh I’d be licking my glass before sipping on this spectacular fall cocktail! How wonderful this looks!! If you do come to New England be sure to come to NH and we can have one of these together!! I took my mother on a New England/Canadian cruise this time last year for her birthday, and the foliage was spectacular. I recall the quaking Aspens living in Northern California, and the trees back home in So Cal, didnt really change, the leaves just fell off. Now I enjoy four seasons in Georgia, and the colors are wonderful. I love a cider drink in the fall, and the crisp Autumn air along with it. Thank you so much for your wonderful ideas you share. Thank you Doris for the nice comment. You know what I’m saying…it’s not that they’re not pretty but sadly, they just don’t measure up to all those years past. I would like to go through another fall with those exquisite colors; it’s on my bucket list!